No matter whether you perform a global or scoped search, you can limit your search to certain fields, and you can employ operators to render your query more specific. Such advanced searches can be very useful if you have a precise idea of what you are looking for, or if a simple search left you with an excessive number of results. 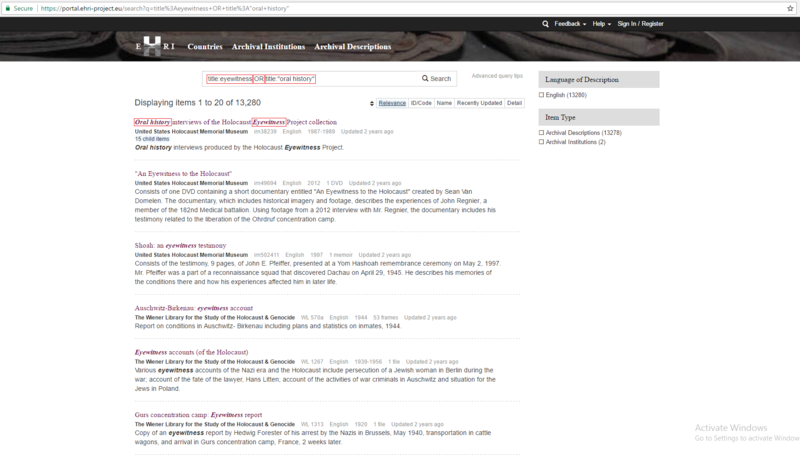 For instance, if you enter the query title:”Auschwitz Birkenau” into the search box on the Portal’s homepage, you will retrieve all descriptions of archival institutions and archival holdings that have phrase “Auschwitz Birkenau” in their titles. 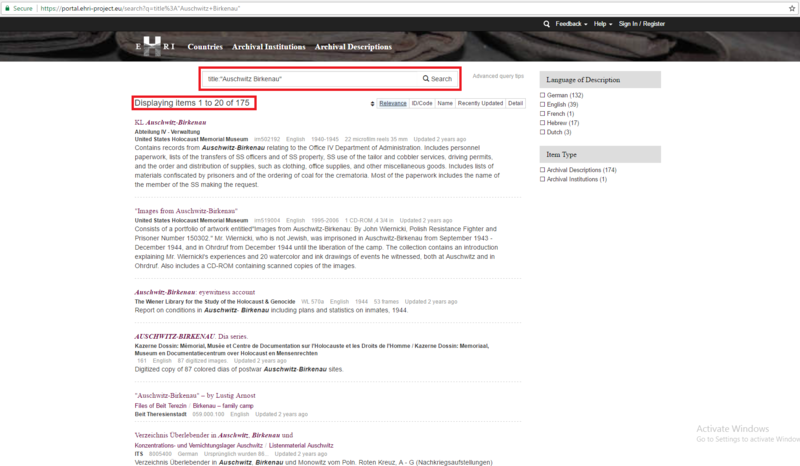 As you can see from the screen-shot below, as of February 2017 this would have resulted in 175 search results (174 archival descriptions and 1 archival institution) - a simple search for “Auschwitz Birkenau” results in more than 1,100 hits. Likewise, a search for identifier:02701-02709 retrieves one archival description which we have already encountered in our scoped search example in chapter 4 above: the “Registry Records of the Holocaust Survivors” collection held at the Jewish Community of Thessaloniki, that is identified by this archive by the number “02701-02709”. As you can see, this is a very precise way of locating a description of which you already know the local identifier. Searches for creator, person, place, subject and address work in a similar fashion, and restrict your searches to information contained in those specific fields. 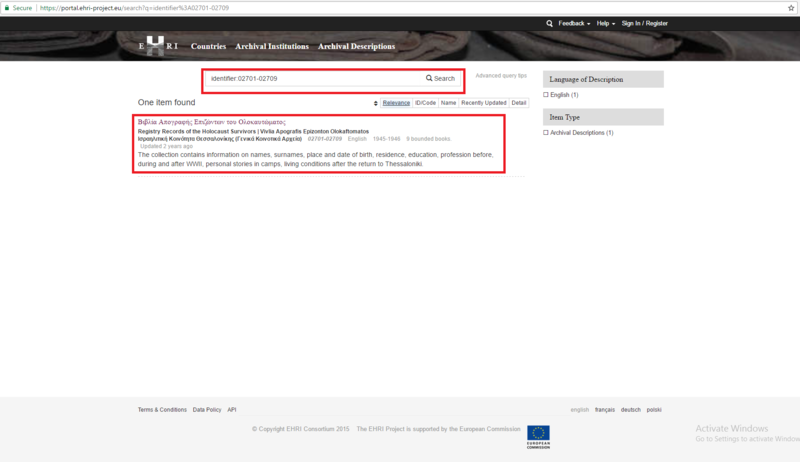 Indeed, you might have noticed that using the query address:Thessaloniki rather than just Thessaloniki would have further improved our search in step 3 of the scoped search example of chapter 3! "Phrase" = Search an exact match of your query, e.g. "Concentration Camp"
You can freely combine these operators. For instance, the query +Criminals -"Nuremberg Military Tribunals" will return all descriptions that contain the word “Criminals” but do not mention “Nuremberg Military Tribunals”. You can also use boolean operators such as AND and OR to combine clauses. 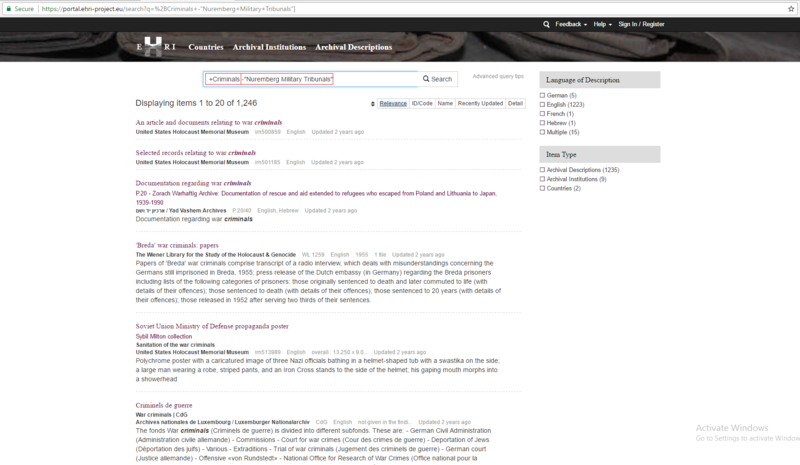 For example, a query title:eyewitness OR title:"oral history" will retrieve all archival descriptions that either have “eyewitness” or “oral history” mentioned in their title fields. Remembering all these different advanced search options can be difficult, but the Portal offers you help: simply click on the “Advanced query tips” link that is displayed next to all search boxes.